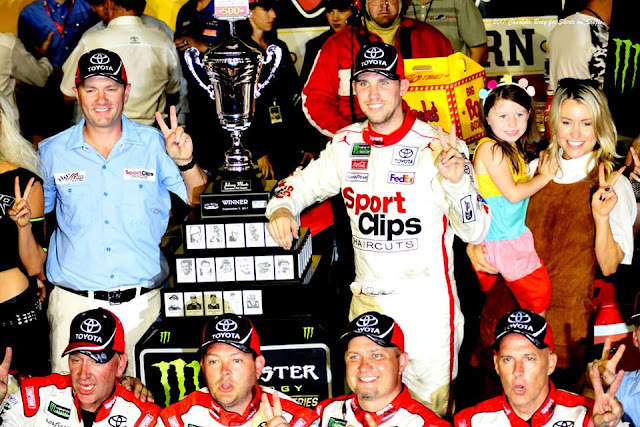 It was another visit to the illustrious Darlington Raceway, bringing joy for Denny Hamlin and his No. 11 crew. As races go, there is usually one thrilled driver and 39 others who are disappointed. It was an unexpected night. Here are five points that might explain why. The Darlington Stripe isn’t an urban legend. 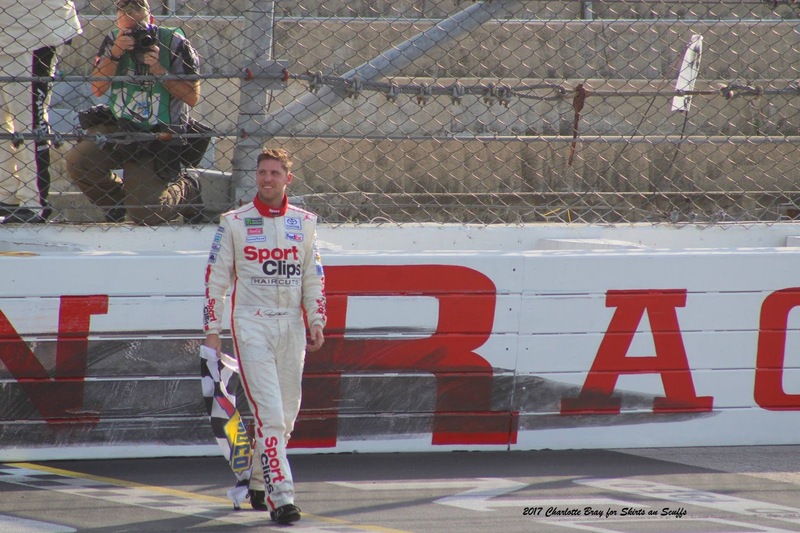 People may think the term "Darlington Stripe" is a phrase from a bygone era, but that theory was disproven on Sunday night. Almost every driver scraped the wall at some point, marring those wonderful throwback paint schemes. The wall juts out and catches the siding of those who don’t pay enough attention. In case you forgot, The Lady in Black reminded you. Denny Hamlin takes the checkered flag in Saturday's Xfinity race. 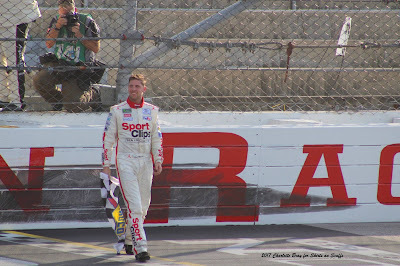 The black stripe on the wall behind him shows where some drivers got their Darlington stripes. Long runs do exist at The Lady in Black. I crunched the numbers before the race, and the past 10 Darlington races had an average of 11 cautions. This led me to expect chaos — and I was proven wrong. It wasn’t as intense as predicted, and even the drivers were taken off-guard. Austin Dillon compared the long runs to “water torture” while he nursed old tires in the dwindling laps. This came with its own wrench in the master plan: varying pit strategies. Dillon held out and finished fourth, despite many thinking it was an insane idea. Who knew long green flag runs could provide even more drama? Larson’s style got the best of him. The beginning of the night was Kyle Larson’s time to shine; running the high line made him a legitimate threat to Martin Truex, Jr. for the overall win. However, as the race went on, Larson ended up brushing the wall enough to cause damage to the left rear wheel. His crew worked on it as much as they could without losing too many spots, but he finished 14th after leading 124 laps. Truex won everything but the actual race. Speaking of Truex, that guy knows how to win stages. He snuck up on Kyle Busch to steal stage one, and he wiped the floor with everyone else in stage two. So, how come he didn’t celebrate in victory lane? A blown tire with two to go crushed his chances at a better result. Eighth isn’t awful, but when you spend the entire day out front? It’s a letdown, that’s for sure. Truex called the race “bittersweet,” and the sugar came after post-race inspection was over: With no infractions, Truex clinched the regular season championship. Pit road issues aren’t the end-all, be-all for Hamlin. I don’t have enough time to list the instances this season where pit road difficulties ruined Denny Hamlin’s day. Speeding, pit crew flops, and everything else under the sun have killed the No. 11 crew’s chances at a solid race. That's what everyone expected to play out when Hamlin missed pit entry. He skidded to slow down, but it wasn’t enough. He later admitted to pushing it so Truex wouldn’t beat him during green flag pit stops again. Drivers tend to have a hard time entering pit road at Darlington due to its configuration, and many assumed this mishap was par for the course in regards to Hamlin. However, the team continued to adjust and improve under the watchful eye of crew chief Michael Wheeler. A strategy call from Wheeler put Hamlin ahead of Truex on the fuel/pit side — but Hamlin had to chase Truex down himself. His pass in the final laps mimicked the desperate move he made to win Saturday’s NASCAR Xfinity Series race, but this win helps him as the playoffs beckon. It’s just Hamlin doing Hamlin things at Darlington — with a very Hamlin obstacle thrown in the middle.